Tungsten alloy teardrop fishing weight, which is one kind of water fishing weight, then it gains popularity in the world because of its small volume combined with high weight. Chinese people refer to tungsten alloy teardrop fishing weight as fishing pendant, like earring pendant we usually wear. It has been designed with pro angler's needs in mind while offering all anglers the opportunity to enjoy the same rewarding experience of catching large fish, consistently. It come with a swivel line clip for secure, twist free operation all day. Tungsten alloy material is lead free and environmentally friendly. Guangxi Chentian Metal Product Co.Ltd's fishing weights are the most versatile weights on the market today. Tungsten Alloy Fishing Weight Tungsten alloy fishing weight is an ideal, environmentally friendly alternative to lead weight, which is toxic and increasingly being labeled an environmental hazard. Tungsten alloy fishing weight is harder than steel and extremely dense, and it being on average 30 percent smaller than its lead counterpart is. Meanwhile, tungsten alloy fishing weight is smaller than conventional weight, create twice the sound of lead weights and maintain their shape for longer. 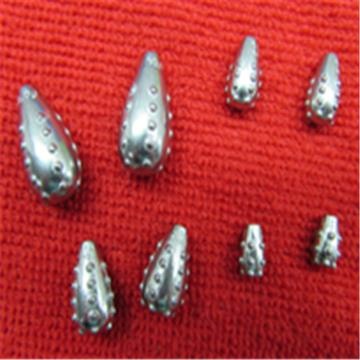 We can offer tungsten alloy fishing weight with teardrop shape, but also could offer various other shapes. Besides, we can manufacture tungsten alloy fishing weight with teardrop shape, weight according to your drawings, or even design it as your specifications.